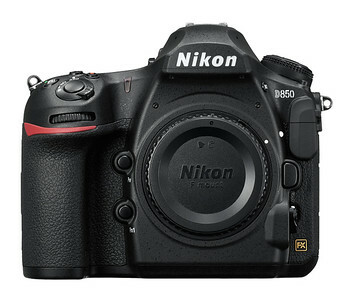 The D850 is gorgeous! So are the lenses that I have listed immediately below. But if you plan on spending much time at all hauling your stuff on your shoulder or through airports, these modern auto-focus zooms, collectively, weight enough to tilt a plane. Don't won't to haul all of that weight? Well, why not try an old classic Nikon lens, the kind that you need to manually focus! These beauties from the 1970s and 1980s can be purchased for a fraction of new lenses, and depending on what you like to photograph, they may be worth a look. The primes lenses from the past take gorgeous photos, are made of real metal, and have that classic camera "feel." So, this is what is in my "other bag." So my wife thinks I'm exaggerating when I tell her that this old camera is really a classic, preferring to believe that it is just an old camera. I show here all of the gadgets and clever engineering, but she sniffs, "Well, I'm glad you're happy, but it's time to go downtown for dinner." "May I take my Rollei?" "Yes, you may take your Rollei." I park the car. We walk less than a city block. My wife and I hear footsteps. A young man stops in front of us, catches his breath, and then gasps, "I am so glad I caught up with you. Oh my God. Is that a Rollei?" "May I take a photo of you holding the camera?" My wife blinks. I smirk. We eat. I will be incorporating Rollei photographs into my 2017-2019 project work. I have a friend who likes to fish. He says fishermen collect and endless amount of gear. He believes photographers do the same. He is right. 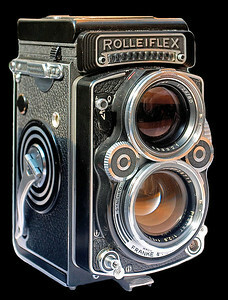 The Linholf is to large format what the Rolleiflex is to medium. But whereas the Rollei, with its rolls of film and simple sets of knobs is fairly straightforward to use, the Linholf and cameras of its ilk are not. At the time of this post (early 2017), I have yet to put my head under that black cover to take a shot. For starters, consider that a 35mm film strip or sensor essentially captures images or data in 1" by 1.5" areas. 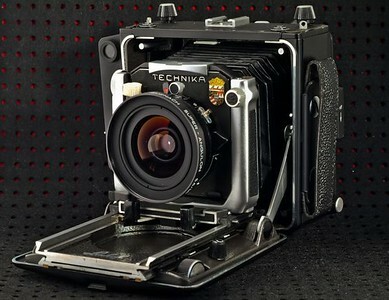 Medium format cameras improve those numbers to the 2.5" by 2.5" range. So if you wished to enlarge a negative to a 10" print, in the 35mm world you may have to magnify by, say 10X, as compared to 4X with medium format. With the Linholf and other large format cameras, many of which use 4" by 5" negatives, the magnification factor is barely 2X. In short, large format photographs, such as the ones taken by the legendary Ansel Adams, retain much of the natural feel, even when greatly enlarged. But I'm not Ansel Adams! This year, I simply hope to become baseline capable with the technology.